An equestrian since the age of four, Helen’s world has revolved around horses both as a rider and as an equine veterinarian. She has competed throughout her life and during the past 10 years as a Quarter Horse Hunter. 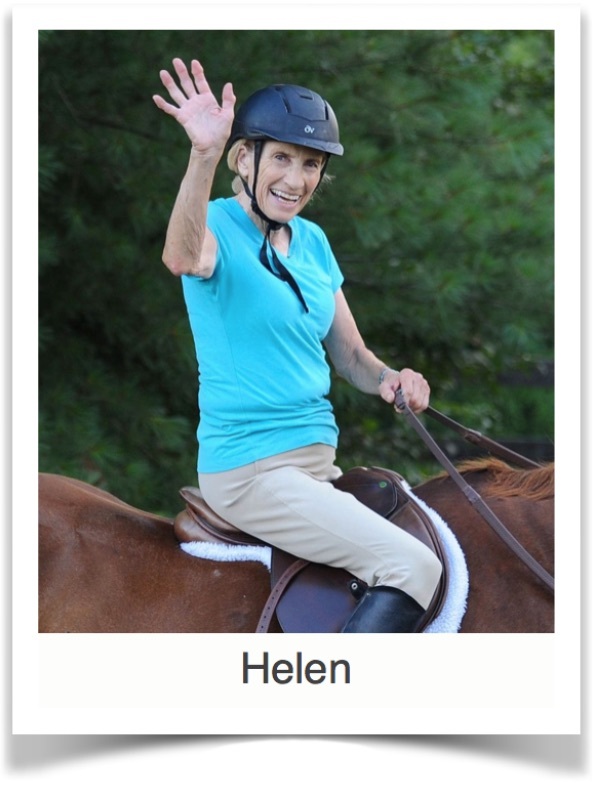 Horse-related injuries were not new to Helen, having sustained multiple injuries to her back, knees, and shoulders. In 2012, Helen was catapulted off her horse during a competition warm up. She fractured her right scapula (shoulder blade) and tore rotator cuffs in both shoulders. She was in a small town in rural North Carolina and deferred treatment until she was able to return home to Northern Virginia. Once home, she consulted with her orthopedic surgeon. He reviewed her MRI and recommended that she receive physical therapy. He did not feel she was a surgical candidate due to the small nature of the rotator cuff tears and it would not be recommended for her to remain in a sling for her fracture secondary to the frozen shoulder that may result. By this time Helen was already significantly limited in range of motion, strength, and function. Helen got full range of motion back in both of her arms and was challenged by the level of exercise she was given in order to reach her goals to return to her duties as an equine veterinarian and competitive equestrian. When Helen was finished with her physical therapy, she remembers she was not simply discharged. Her therapist gave her a complete home exercise program and recommendation of where she could follow up for continued exercise instruction. Just seven months after Helen’s complete arm incapacitation, she was able to not only participate in but capture the title of Reserve World Champion in Hunter Hack when she competed in the Quarter Select World Championship!